Review: "Just breath" my mom would say. 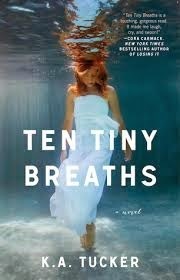 "Ten tiny breaths. Feel them. Seize them. Love them." Four years ago, Kacey's life was changed forever when her parents, best friend and boyfriend were killed in a drunk driving accident. When her uncle becomes a little too interested in her younger sister, they flee to Miami to start a new life. Kacey has a difficult time opening up to people but tries to be a good guardian for her sister Livie. When she meets Trent, she is surprised when she starts feeling again for the first time in years. If you are looking for an emotional read, you will enjoy this book. Kacey survived a horrible accident and is suffering from PTSD. Although she is rather unlikable throughout the book, I still empathized with her because of what happened. It's unimaginable and heartbreaking. I really enjoyed the secondary characters, specifically her stripper/bartender neighbor (with a heart of gold of course), her boss at the bar and her landlord. Kacey's love interest is her neighbor Trent, who already recently moved to Miami and is hiding secrets of his own. I'll avoid spoilers, but I figured out the 'twist' pretty early, however that didn't detract from anything. Actually, I couldn't wait to see how it all unfolded, which was not how I expected. While the attraction to Trent didn't seem much more than physical (she falls in love with him quickly although mostly we know he's hot and likes to watch her work), I understand that certain people just 'click' and that's what she needed to break free of herself. My only complaint is that I did not enjoy the ending, which I thought was very unrealistic. I'll avoid spoilers, but I don't see how an mental health professional would support the conclusion. Overall-emotional read that I really enjoyed. The is the first in a series and I'll be reading the rest of them.